The Dodgers will face the Los Angeles Angels of Anaheim for an exhibition game at Dodger Stadium Friday, March 29 at 7:10 p.m. Friday will also mark the return of the Dodger Stadium Express, a complimentary shuttle service from Union Station in downtown Los Angeles to Dodger Stadium. 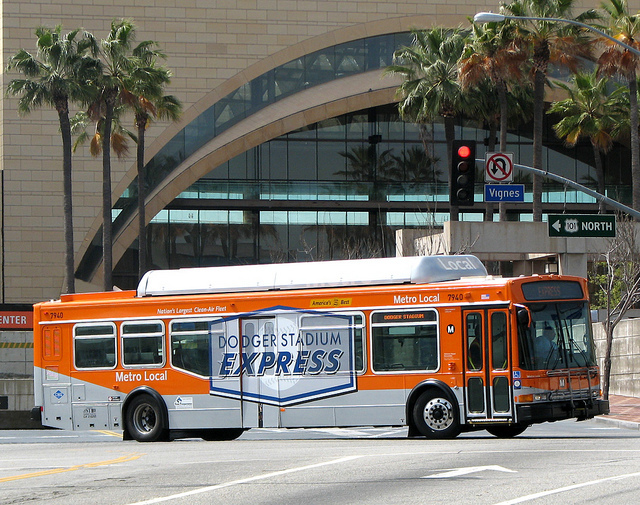 For the fourth consecutive year, LA Metro will offer the Dodger Stadium Express bus service, but with an additional perk for 2013. For the first time, the Dodger Stadium Express bus service will include a dedicated bus lane on Sunset Boulevard from Union Station to Elysian Park Avenue. Dodger game day tickets will be honored as payment to ride the bus service and the shuttle will operate 90 minutes before the game and 45 minutes after the game starting Friday. Regular season service starts on Opening Day, Monday, April 1. The Dodgers will return to Southern California tomorrow for a split-squad exhibition game at The Epicenter against the Single-A Rancho Cucamonga Quakes at 6:05 p.m. and a contest against the Angels in Anaheim for the first game of the three-game exhibition Freeway Series set for 7:05 p.m. at Angel Stadium. The Freeway Series continues Friday with a 7:10 p.m. game at Dodger Stadium and wraps up Saturday with a 6:05 p.m. game in Anaheim. Starting Friday, fans are encouraged to use the many transportation alternatives that serve Union Station and that will connect them to the new Dodger Stadium Express. For specific route and schedule information fans can visit www.metro.net or call 323.GO.METRO. Tickets can be purchased by visiting www.dodgers.com/tickets or by calling 323-DODGERS.